Aerial view of The Farm at Mill Creek's location. Image courtesy of the City of Mill Creek. The Mill Creek City Council is scheduled to discuss a new East Gateway Urban Village mixed-use development called The Farm at Mill Creek at a special city council meeting on Tuesday evening, February 19, 2019. In fact, the city council’s planning calendars for the past year or so suggest that this discussion has been postponed many times. According to these documents, The Farm at Mill Creek development discussion was originally scheduled for May 1st last year. The Farm at Mill Creek’s development proposal was formally submitted to the city on March 23, 2018. 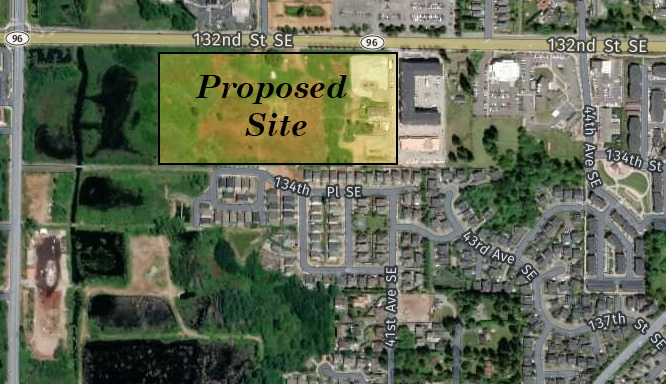 The proposed project site is located on 132nd Street SE just west of The Vintage of Mill Creek. The proposed mixed-use development is comprised of ten buildings on a 17-acre site. The buildings will house retail businesses, medical offices, and multi-family apartments. According to the proposal the site will include 356 apartment units, and 26 live/work units totaling approximately 344,720 square feet of multi-family residential space. Additionally, there will be approximately 68,600 square feet of retail space and 16,600 square feet of office space. According to a City of Mill Creek news release, city staff will summarize the city’s process for approving the development ”including the relevant codes, regulations and policies, as well as how the developer will mitigate community impacts” at the February 19th meeting. The news release also stated The Farm at Mill Creek’s developer “will present his vision for the development and benefits to Mill Creek” at the same meeting. The city council will allow residents to provide their comments during the public comment portions of the meeting, which are at the meeting’s beginning and again at the ending. According to City of Mill Creek code and regulations, the city council must approve all East Gateway Urban Village development agreements. This decision will not be made during the February 19th meeting. Ryan Patterson, The Farm at Mill Creek’s developer, also built The Vintage at Mill Creek in East Gateway Urban Village. He will hold an open house for interested residents to learn more about the new multi-use complex from 5:00 to 7:00 pm on Wednesday, February 20th, at the Mill Creek Senior Center located in The Vintage at Mill Creek. The city council plans to discuss The Farm at Mill Creek again at their regular February 26th meeting. The new development’s required public hearing and final city council discussion where they will make their formal decision regarding the development has not yet been scheduled, but will most likely occur in March. Aerial view of The Farm at Mill Creek's proposed location on 132nd Street SE. Image courtesy of the City of Mill Creek. I wonder if this project pays enough mitigation fees to help out our overcrowded high school. Probbly not. They have been artificially low for quite a long time.